It is the beginning of the end. Of that I'm sure. 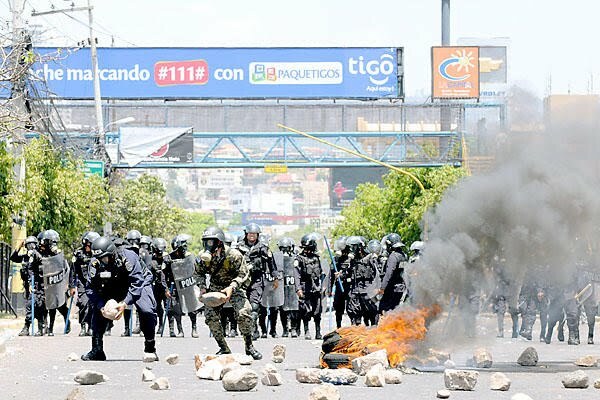 I'm just not sure if it is the end of the strikes, the end of the teacher unions, or the end of hope for Honduras to become a developed nation. Relying on the Labor Code, President Pepe Lobo issued a public statement on Sunday declaring the teacher strike unjustified and illegal. He reiterated his position to dialogue with the unions, but only after teachers go back to the classrooms. a) Teachers who do not return to the classroom on Monday, March 28, will be suspended without salary for two months. b) Teachers who do not return to the classroom by Wednesday, March 30, will be suspended without salary for six months. c) Teachers who do not return to the classroom by Monday, April 4, will be suspended without salary for one year. d) The government will proceed to take administrative measures to fire teachers who do not comply. The declaration also provides for the temporary suspension and possible dissolution of the teacher unions who have promoted and supported the illegal strike since March 8. Not explained is how the government will monitor which teachers are in the classroom and which are not, since it is obvious that there is no system in place for that. The government has opened telephone line 104 for the public to report teachers who are not working but an anonymous telephone call will not hold up in labor court. Labor unions have responded with "What more can they do to us? They kill us, they gas us, they reprimand us, they put us in jail. Teachers will continue in the struggle." Statements like that distort the reality but will play well in the international media and among the "human rights" groups. Jaime Rodríguez, one of the most militant of the teacher union leaders, says that this (the violent protests) is "informal education" for the young people of Honduras and that they need to lose their fear of the "puppets of the oligarchy". 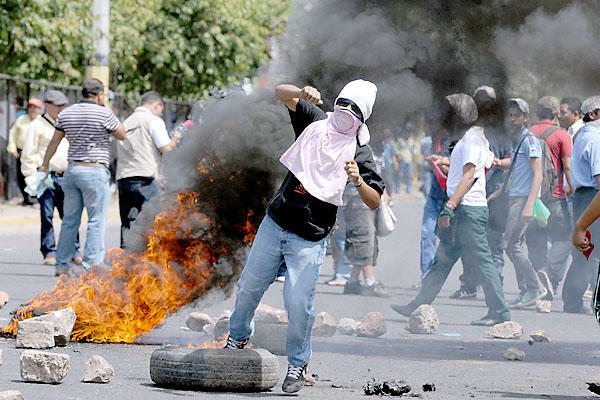 The protests are becoming increasingly violent with rioters even attacking passing vehicles. The National University in Tegucigalpa was forced to shut down last week due to violent protesters. 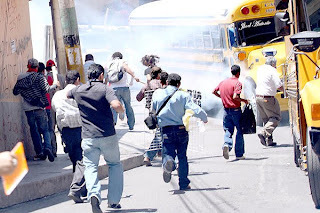 Óscar Alvarez, Minister of Security, has been given responsible for the safety of children and parents at the schools, while teacher union leader Óscar Recarte has warned parents to keep their children at home due to the danger of unknown teachers and the presence of armed police and military. The noon news showed parents protecting some schools, while at another, some parents were protesting against new teachers. 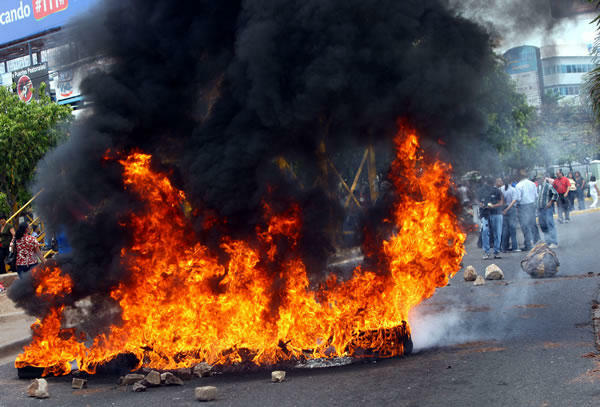 Today's riots, shown in these El Heraldo photos, are primarily confined to Tegucigalpa. 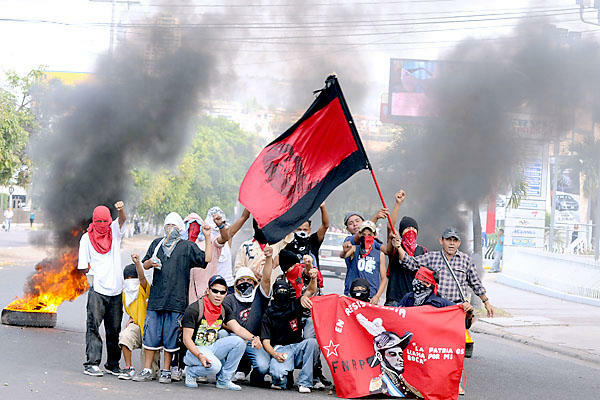 Additionally, the Resistance Front (FNRP) has written to the UN, OAS, US, European and South American countries to request that the FNRP be recognized as the official representative of the people of Honduras and that these countries and organizations take action to restore democracy in Honduras before more lives are lost. 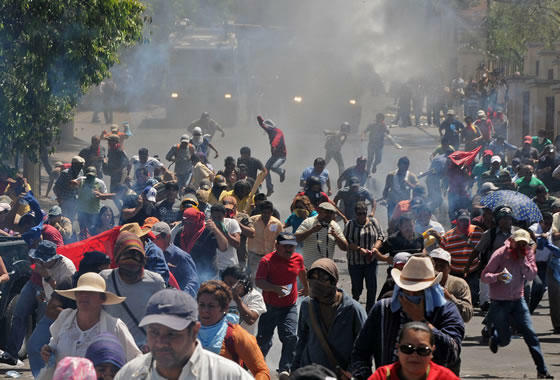 The agitators are hoping that the international community will compare Honduras with what is happening in the Arab countries. What's next? Will they be asking for a no fly zone? Lobo says that behind the teacher union protests is a political agenda. He affirmed that people who come to the protests, attacking police and damaging private property with rocks, bats and Molotov cocktails, are not teachers, but rather are agitators paid L.400 to L.1,000 by foreign interests to promote anarchy in the country. Lobo says that the motive is to prevent the reincorporation of Honduras to the OAS, a matter which is to be discussed in the June meeting. The Resistance (FNRP) and various unions have promoted a Grand National Civic Strike on Wednesday, March 30. Reported proposed changes to the public employee retirement law would raise the voluntary retirement age from 58 to 65 and the mandatory retirement age from 65 to 70. The CGT union leader told members that this reform will result in a 40% decrease in pensions — that alone should be enough to bring thousands to the streets. Public employee unions, including doctors and nurses, have threatened mass strikes which will paralyze the country. On Friday, employees of the National Register of Persons (RNP) and two hospitals struck. Vilma Morales, President of the National Bank and Insurance Commission, says that there will be dialogue prior to any changes and that the draft is not in Congress yet. She noted that the most important thing is the continued overall security of the retirement system. Morales says that union leaders are being confused by absurd misinformation, like false statements that the retirement age will be raised to 75 and that the 13th and 14th month salaries will be discontinued. 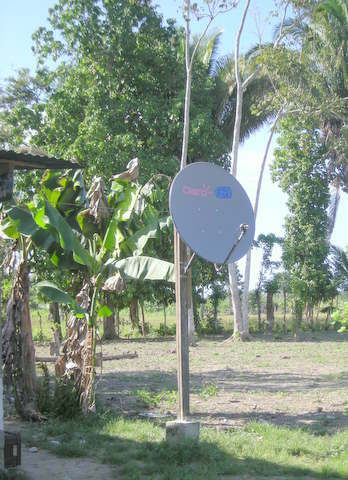 Television stations and newspapers are benefiting from the quantity of false information (some of which, like Globo TV, they put out themselves), with the government and other organizations buying commercials and taking out full page ads to clarify the situation. Friday, April 1, is the day that President Lobo has promised to declare the new 2011 minimum wage, because representatives of the labor unions and business sector along with the Minister of Labor were unable to negotiate the new annual increase. Lobo has not divulged whether or not the increase will be retroactive to January 1. The announcement is likely to be met with further strikes. By law, when the negotiating parties are unable to agree on a new minimum wage, the President is supposed to declare the new wage by January 1 each year. Initially, workers representatives started by demanding a 22% increase while business representatives said that any more than 3.6% would result in the loss of jobs. Unions are now saying the increase can be no less than 7%, the inflation index. As an aside, last year's minimum wage increase was minuscule despite the large increase in the cost of basic necessities of life. It was not announced until November 2010 and was not retroactive. When unions were naturally upset, Lobo took a dismissive tone and even laughed to reporters, saying something like, "What's the problem? It's only for two months and then there will be a new minimum wage in January (2011)." In some cases, it is easy to understand the unions' anger and frustration with the government and with Pepe Lobo's attitude in particular. Other protests have occurred due the high price of basic food items and the ever-increasing price of fuel. As a concession, the government decided not to increase the cost of electricity in April, despite the fact that much of the country's electric supply is generated from fuel, the cost of which has increased significantly in the past few months. 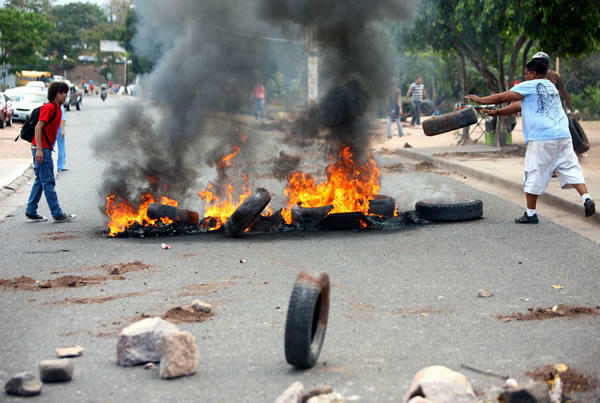 Many people in Honduras believe that the president can control the price of fuel by snapping his fingers and have no awareness that the price of gasoline in Honduras is similar to other Central American countries or that the price of food items and fuel have risen worldwide. 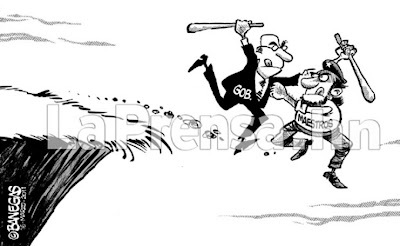 In 2008-2009, when the worldwide price of a barrel of oil went from approximately US $105 to $65, President Mel Zelaya took credit for the decrease in Honduras fuel prices. Apologies to all the striking groups who I have failed to mention. There are only so many hours in the day. Printed on government letterhead and websites is the motto of President Lobo's administration, "The government of national unity". After seeing this video on the noon news and being so impressed with this teacher, I sat by the 10 p.m. news with my camera at the ready hoping that they would replay her interview. This video is for my Spanish-speaking readers, especially those not in Honduras who may not have the opportunity to hear the opinions of some of the good, sensible teachers. I apologize that I just don't have the time to try to translate it. Suffice it to say, this long-time teacher doesn't agree with the strikes, thinks the unions are on the wrong path, and states that she has no confidence in the union leaders. Just before the teacher interview, there is a brief interview with a mother who has been threatened by activists and is staying the day at the school with other parents to protect the children. Update: A translation of the video is included here. I sometimes get carried away with emotion when writing about the education system and the "teachers", as if all teachers are the same and act the same. Of course, they aren't all the same. Very few teachers actually go out marching in the streets or set tires on fire or encourage their students to do the same. There are good dedicated teachers and there are some schools that never miss a day of class. It's hard to remember that when I think about all those children whose only tiny ray of hope of ever pulling themselves out of a lifetime of dismal poverty is to get a good education and they are being deprived of that year after year. Worse than that, after years and years of the same nonsense, students and a lot of parents are lulled into thinking that education must not be that important. I try to specify the 'teacher unions' and 'union activists' in most of my writing because I believe that is where the majority of the blame lies. The unions purposely try to mislead teachers into thinking that their jobs or pay or whatever are being threatened by the government or that other teachers' rights are, such as the famously growing number of teachers who haven't received pay in famously increasing number of months. But then what does that say about the intelligence of teachers who don't investigate an issue for themselves, read the proposed laws, and form their own decisions? Not much. There are many other teachers (most teachers, according to the IABD study) who strongly say that they don't agree with the unions or the strikes but they don't do anything to change the situation. I do understand that there is physical risk in standing up against the unions as well as job risk. But teachers, after all, did elect those militant leaders. I'm losing patience with these teachers. Teachers who allow themselves and their students be used by the unions for political purposes become part of the problem, too. They are basically saying that it is all right to let the children suffer as long as they don't personally risk suffering. I lost patience with the government long ago. The government has had a decade to correct the payroll issues. 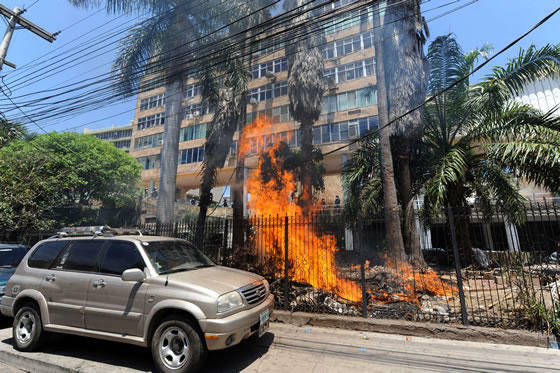 Nothing was done about the 2008 TSC payroll audit until the civic group Transformemos Honduras [Spanish] [English] brought it to light and publicly demanded action. Lobo declared last year that protesters would not be allowed to "take" public buildings, yet school directors lock the gates and don't allow students or willing teachers to enter. Lobo could send a couple of police officers or soldiers to cut the lock and stay to maintain order and prevent the union activists from intimidating parents and teachers who are willing to work. He could, but he doesn't. Despite his announcement of emergency measures on Friday, over the weekend Honduran President Pepe Lobo offered another chance for dialogue to the teachers' unions, which they rejected because they demanded that Lobo personally be involved. Though Lobo said that he would not negotiate further until the teachers were back in the classrooms, he delegated Minister of Education Alejandro Ventura and others to dialogue with the unions. Lobo also now says that no teachers will be fired because he respects the Estatuto de Docente (teacher law), which apparently provides that no teacher ever placed on the Education payroll can ever be taken off for any reason during their lifetime, and in some cases, even afterward! 2) That the TSC stop the payroll audit and cease the demands for repayment by employees who have received irregular and fraudulent pay. You'll notice that this is a different list of demands than was given in Friday's newspaper [summarized in my article No school; strikes, standoffs and now death]. Part of the problem is that there are several unions and they don't always agree on priorities. Years of "negotiations" and trying to placate the unions has resulted in never-ending chaos. The unions have ever-changing, ever-increasing, insatiable demands. Some demands, like missing paychecks, are 100% valid, but notice that missing pay didn't even make the list this time. On numerous occasions in the past, the government has said, "give us a list and we'll pay them". 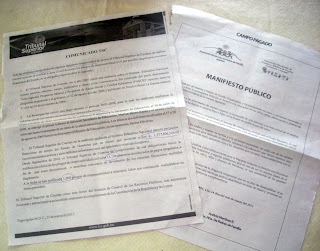 The unions provide lists and the government pays, and the next month there are claims of a new list and a new strike. Despite prior laws and agreements, teachers refuse to be tested. Teachers refuse to be audited. School directors, unions, and politicians can put their friends and relatives, who may not work in any school anywhere, on the payroll. The education payroll even includes teachers who no longer even live in Honduras or who don't exist period, but incredibly Minister Ventura claims that the Estatuto de Docente prevents him from doing anything about it. The union representatives walked away from Lobo's latest proposal, as they always do, and called for an indefinite, country-wide strike, as they always do. The unions have shown year after year that they have more power than the government. They have brought the last four presidents to their knees and have spent 14 months doing the same to this president. Somehow, sometime, the government and the political parties have to take a stand for the sake of 2.3 million public school students who are being raised in ignorance and who are being taught by example that anarchy is the answer to every problem. Too many children are being taught by their teachers' example that "me" and "my rights" are the only things that count, that personal responsibility doesn't matter, that the rights of all others may be trampled for your purpose, and that if you don't get your way, you throw a fit and set tires on fire. An entire generation of children have been deprived of an education and now an entire population of new teachers has been educated under this same deficient system and with this same lack of ethics. But action is not only needed for the sake of the children. Honduras is in a vicious, downward spiral of poverty and crime that can only be changed with drastic action. Can new businesses and badly needed jobs be attracted by the "Honduras is open for business" campaign with the kind of environment we have now? Government officials are kidding themselves if they don't think that companies will do their own investigations of the quality of the workforce in Honduras. On Monday, the first 1,200 teachers were suspended for periods ranging from one month to one year, including six union leaders. The government has threatened to no longer withhold union dues (several hundred million lempiras per year) or lMPREMA loan payments (totaling L.82 million per month) from teachers salaries; the teachers will have to voluntarily make their payments directly to the unions. But the government so often backtracks on its threats that I won't believe this one until it happens. Many teachers returned to class on Monday, despite public warnings from the union leaders on the radio that teachers and substitutes would be forcibly removed from the classrooms and even physically attacked. Both working teachers and parents have reported being personally threatened by militant teachers and union activists. Minister Ventura promised to protect working teachers and called upon parents for their help. Many parents are staying at schools all day to protect their children and support the teachers who want to work. But an estimated 3,000 (out of 60,000) teachers joined by high school and university students are still protesting, along with, some say, Zelayaistas of the Resistance and agitators from Nicaragua. Minister of Security Alvarez says he has photos and other evidence of foreign participation. Fourteen police officers were injured yesterday, including one policeman who was brutally beaten by a gang of about 10 protesters (captured on video and shown on the news last night) who ran away when the officer pulled out (but did not use) his gun. 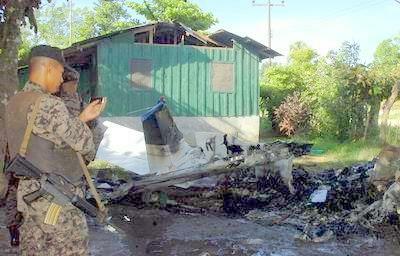 At least one soldier was injured. Protesters threw tear gas canisters back at police [photo]. 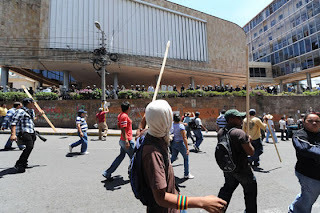 Additionally, windows were smashed at several private buildings and workers and customers inside were terrorized by protesters using 2x4 bats studded with nails, rocks, and bottles, which they also threw at security forces (also captured on video). Private vehicles and public property were damaged as well. 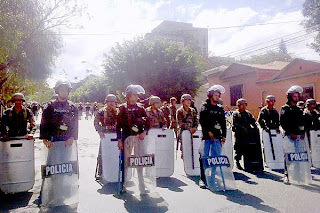 Today, a huge contingent of police and military are protecting the perimeter of the US Embassy from Zelayaistas. Protesters were prevented from disrupting traffic around the National Congress, but only after starting a fire which damaged some private vehicles. President Lobo appointed a new mediating commission, headed by the Minister of Human Rights Ana Pineda and Zelayista Minister Cesár Ham, to once again negotiate with the unions. Lobo says that he welcomes foreign participation in the commission. There is not a chance in the world that the education problem will ever be solved through negotiation. 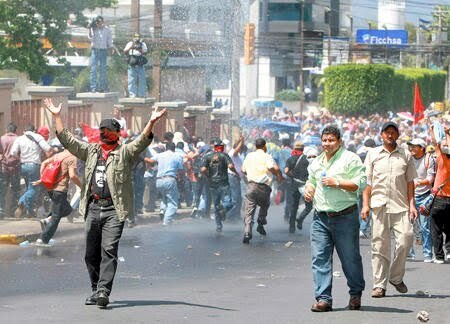 Minister Pineda also requested that the use of "brute force" to dislodge the protesters be stopped. 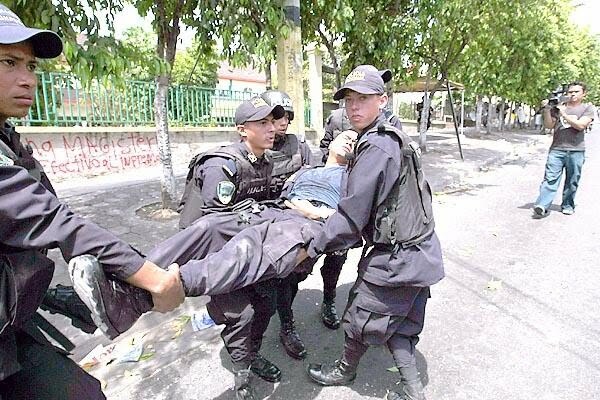 Minister of Security Alvarez responded that the police were following exactly the constitution and laws of Honduras and international norms. On a television talk show, he said that the use of water canons and tear gas are the same tactics used by all civilized countries, including the US. If I were Queen of Education? The time for dialogue and negotiation has long passed. Everyone knows how ridiculous it is to even suggest that this cesspool of chaos, corruption, and political interests can be resolved through negotiation. Negotiation has been tried hundreds of times over the last decade. Even when agreements were reached, the unions never complied with the requirement placed on the teachers and the government often made promises which it had no hope of keeping. 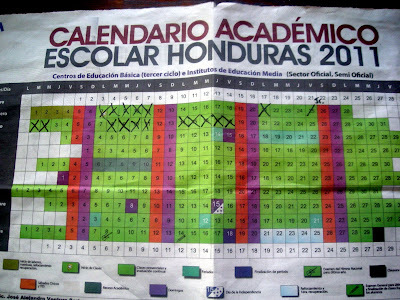 It's time now to take drastic action to finally protect the rights of the children and the citizens of Honduras who cannot afford private education, and to enforce the laws of Honduras, most of all the constitution, which guarantees the right to education as well as the right of free circulation, and states that no person or group of people are above the law. When all else fails, and it has, that ball falls into President Lobo's court, despite his efforts to deflect it elsewhere. 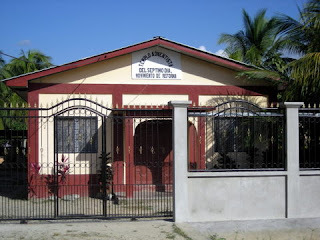 Being a former auditor, my highest priority would be a complete independent audit of the Ministerio de Educación payroll by an international public accounting firm, along with the implementation of some sort of reliable, corruption-resistant payroll and attendance system that would hold teachers and administrators accountable. A solid payroll system will eliminate the most valid of the complaints, limit irregular payments, and will provide an "audit trail" which could allow the government to take appropriate action in the case of fraud and corruption. Who knows? There might even be enough money left over to put roofs on the schools and desks and books into the classroom. What a concept that would be. Similarly, the unions — if they really were looking out for the well-being of the teachers — should welcome an independent of audit of IMPREMA. 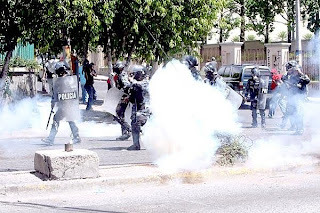 But it is likely that some of the largest irregularities will point to the Zelaya administration so the politically motivated unions reject an audit to the detriment of the future security of their members. In both cases, detailed independent audit reports made public would help to stop the blame game finger pointing that occurs now because both the government and the unions have lost their credibility with the public. No more "time outs" for protesters; they should be charged with the crimes that they commit just like any other criminals and teachers convicted of crimes should be immediately fired. Any government employee convicted of defrauding the government should be barred from ever holding another government job. 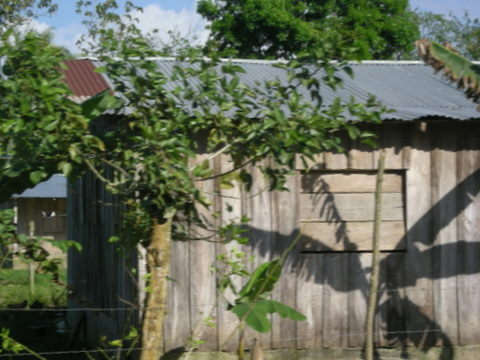 The Estatuto de Docente should be revoked as the teachers have never complied with their obligations under this law and the Inter-American Development Bank report [full report in Spanish] [summary in English] clearly shows that it has been detrimental to the quality of education as well as being completely unsustainable financially. Teachers who do not work should be fired after three absences, period. Union membership should be voluntary. Both payroll and IMPREMA should be periodically audited and frequently subject to spot checks. Procedures should be put in place to ensure that all decisions and loans of IMPREMA are financially sound and not politically motivated. All teachers should be rigorously tested both academically and psychologically to see if they are fit to be teachers; those who are not should be fired. With 20,000 unemployed teachers in Honduras, there is no need to retain teachers who do not have the morals, ethics, or desire to teach children. Everyone must put politics aside and do what is right for the children and the future of Honduras. Enough with the incessant, hollow lip service in the name of these 2.3 million children! Take action. Many will complain no matter what decisions are made — that is guaranteed. But if leaders take the high road, those complaints will be shown for what they are, personally and politically motivated. And to President Lobo: please, please follow through on what you say and don't say anything unless you are prepared to back it up with action. This constant fluctuating from one position to another is confusing and only makes the situation worse by frustrating the teachers as well as those who support you. This is a situation where you can not possibly hope to make everyone happy. Accept that and do the right thing for those who can't stand up for themselves. You will go down in history being respected for that. 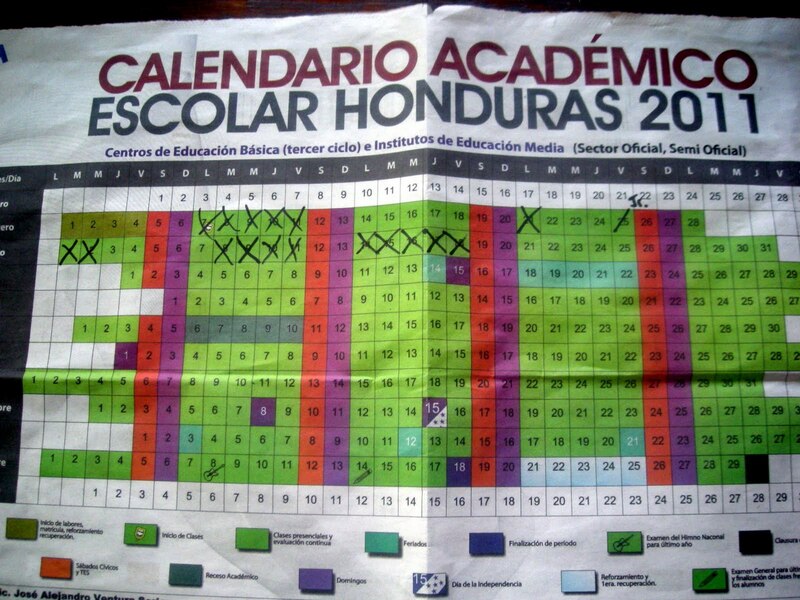 This is the Honduran school calendar. To get a better handle on what is really happening, I asked Arexy to help me keep up with the strike days of the public school where her children attend. The 'X's' represent the school days missed by Arexy's children due to teacher union strikes. School was originally supposed to start February 1st but the opening was delayed for a week for some reason. In the 6 weeks of school to date, one of Arexy's boys has had 12 days of classes and has been locked out of the school the other 17 days. Her older boy in fourth grade wasn't allowed to attend school during the only full week that they actually held classes because his paperwork wasn't in order [article in English]. Additionally, one day that the school was open, his teacher didn't show up so his class was sent home. So out of 6 weeks of school, he has received 7 days of classes. Also to be considered is that generally more strikes occur in Tegucigalpa where most of the unions are headquartered than in La Ceiba. 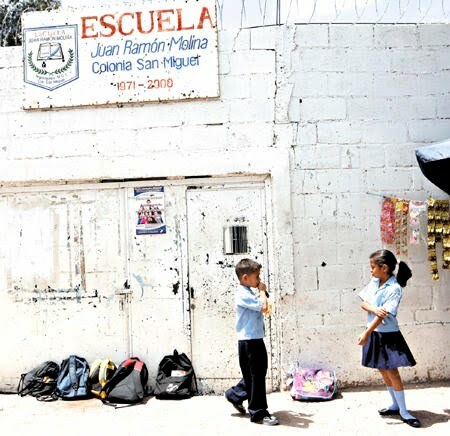 1) They don't want schools transferred to local municipal authorities, as is currently being discussed in Congress [link in English] due to the chaos in the educational system and an effort to allow more citizen participation/oversight. 2) They want 6,000 more teacher jobs, even though the government clearly can't even afford the current teachers' salaries. 4) The debt that the government owes to IMPREMA (the teacher retirement fund) which incidentally was primarily incurred during the Zelaya administration when the government withheld teacher's retirement payments but did not submit the money to IMPREMA. IMPREMA is a cesspool of corruption, incompetence, and political and union interests which is on the point of bankruptcy. 5) They want respect for the Estatuto de Docente (teacher law), which incidentally teachers and unions have shown no respect for themselves. While they are quick to demand all the rights and privileges granted under this law, they completely ignore their obligations. For example, the law requires 200 days of classes per year. In the past decade, teachers have averaged 125 days according to a study by the Inter-American Development Bank (IDB) [summary in English]. Congress and others have discussed repealing the law because the salaries and bonuses are completely unsustainable, as confirmed by the IDB study, which also pointed out the chaos in the Honduran educational system and the damage done by the unions. 6) They want salaries paid to teachers who have not been paid. Estimates range from 1,000 teachers have not received their entire pay to 6,000 teachers did not receive any pay in all of 2010. The truth is probably somewhere in the middle. But it is not even clear if all of these are legitimate teachers who actually teach anywhere. Some say the numbers include political appointees who did not receive a position but want to be paid anyway. A few days ago, President Lobo announced that he would do no further negotiation with the teachers' unions until they went back to the classroom. He said that days not worked will be days not paid. Lobo promised them that if they "take the streets", the police will remove them. He also said that if they don't want to work, he'll fire them and hire some of the 20,000 unemployed teachers. Yesterday, President Lobo reiterated his resolve to "put the country in order", saying he is "strong as an oak". A bit of a wobbly oak, though, as the teachers are always allowed several hours of major road blockages before they are dislodged. From that point on, the unions declared an indefinite strike and the protests have gotten increasingly violent, with union representatives even attacking and intimidating parents. Two schools were burned down last week. The teachers are egged on by former president Mel Zelaya, who issues public letters from the safety of his Dominican Republic mansion. "Forward, teachers! Right is on your side!" Zelaya incredibly claims that he put the educational system in order when he was in office! 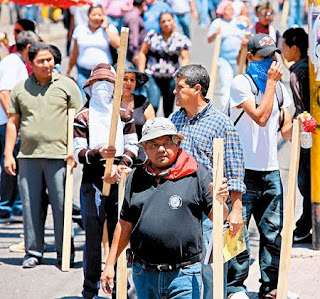 I hope that those teachers who were out striking the entire year before Zelaya was ousted will remember at least a few of these dozens of strikes [Honduran teachers: The czars of strikes, documentation of teacher strikes from July 2008 to June 2009, in English]. Zelaya also tries to claim that the last two administrations borrowed money from IMPREMA, causing the institution's financial problems, when it has been documented that the loans or debts occurred prior to June 28. In his long rambling letter, Zelaya spreads the blame among the Honduran government, Pepe Lobo, the International Monetary Fund, the money-hungry, the ruling class, foreign capitalists, and, of course, the United States of America. Yesterday, another long list of teachers was published in an announcement in the newspapers as owing the government money due to overpayments of salaries. Several of the teachers owe around a quarter million lempiras each! Many more owe in the neighborhood of L.100,000. In total, the audit shows that approximately 20,000 teachers (out of a total of around 60,000) have received overpayments totaling L.900 million and must pay them back. 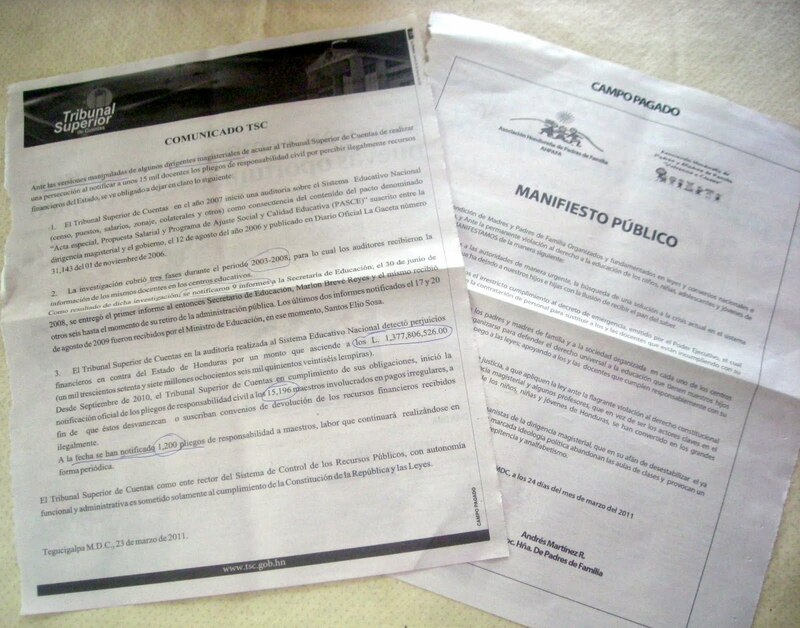 Transformemos Honduras originally exposed the existence of the audit and demanded action. TH says the audit report, which only covered a period through July 2008, was ignored by the Zelaya administration who took no action upon it. TH estimated that if the payments have continued without correction, the total would have been over 1.1 billion lempiras (about US $65 million) by the fall of 2010, and much more by now. Today teachers were dislodged from the streets of Tegucigalpa with water canons and tear gas. A teacher was knocked down during the stampeding melee. She was run over by (according to which 'news' you listen to) the mob, a white pickup truck, or a police vehicle. She died after reaching the hospital. Shortly after that, the government declared a state of emergency in the public education system. Actions will include the temporary hiring of substitute teachers to be paid with the deductions made from the payroll of striking teachers. 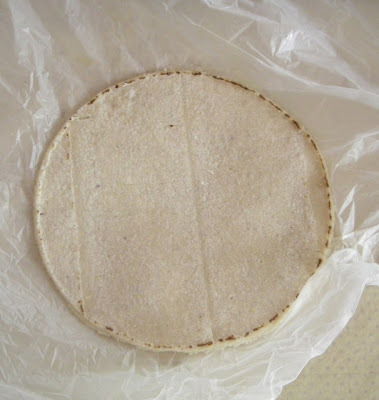 Some of the restaurants in town are now serving these machine made corn tortillas. All are perfectly round, exactly the same portion, perfectly formed, and perfectly tasteless. I'm all for progress and have more than my share of kitchen gadgets and machines. 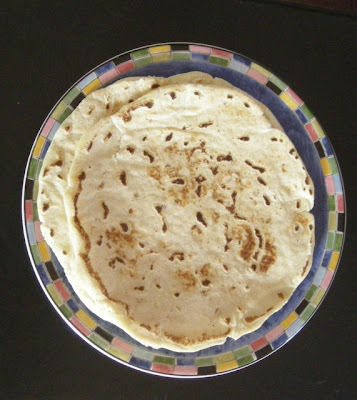 I realize that tortillas are labor intensive and time consuming to make by hand. But....made by hand is how they must be! Now these are real tortillas, lovingly made by the hand of Arexy. Personally, I prefer flour tortillas, but hot-off-the-stove, I'll take a couple of these with my beans and rice any day. These tortillas have color. They have character. They have texture. But most of all they have flavor. Comparing these tortillas to the machine made is like comparing a hot, crusty San Francisco sourdough to a week-old bag of Wonder bread. I really don't like seeing this trend to machine tortillas in La Ceiba. Progress is not always a good thing. 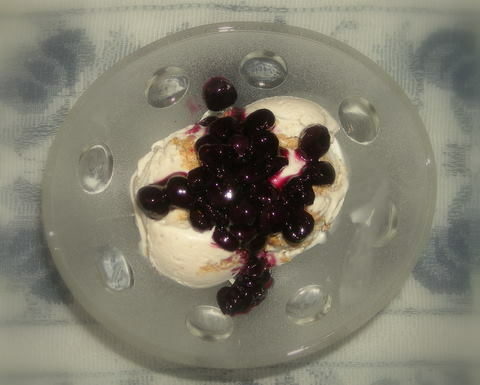 La Gringa's blueberry cheesecake ice cream with graham cracker crust bits. Double posting — Two articles in one day. I just wanted to get the bad taste of that last article out of your mouth and put this good taste in. Necessity is the mother of invention. I had two beautiful, thick, boneless pork chops. I had planned to make baked pork chops with scalloped potatoes, which is one of El Jefe's favorite gringo ways to prepare pork chops. But when I went to the fridge, I discovered that I only had three tiny little potatoes — not enough. Looking around, I had chiles galore, half an onion, .... oh, and those beautiful piñas that were given to us in El Gancho, Honduras, along with some cocos and cacaos. 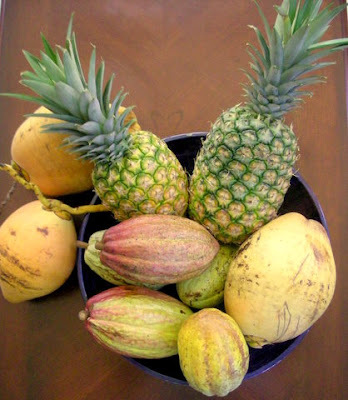 I love pineapple with pork and so does El Jefe so that decided it. 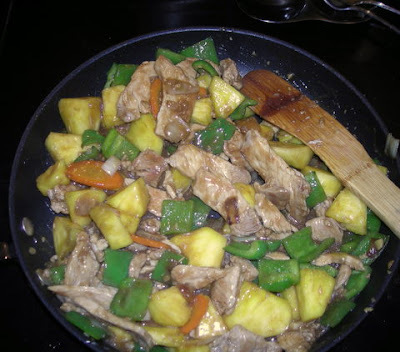 Pork and pineapple with chiles, garlic, and homegrown fresh ginger. Yum, yum, yum! The pineapple was absolutely outstanding. Playing it by ear, I used 1 1/2 large chiles, 1 carrot, 1/2 onion, and initially, half of the pineapple, cut into chunks. 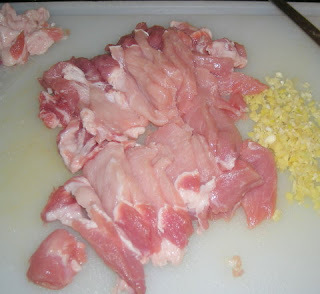 I trimmed off as much fat from the pork chops as I could and then sliced them thinly. Truth be told, one pork chop would have been enough, but I already had sliced them both, and El Jefe never complains about an excess of meat. 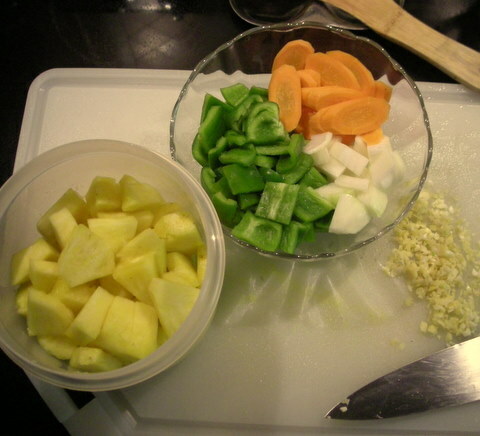 I cooked the onion and carrot until the onion was tender, then pushed it to the sides of the large pan while I browned the thin slices of pork, half at a time, along with the minced garlic and ginger. I only used a bit of salt on the pork and none on the veggies, because the soy sauce I planned to use is so salty. When the pork was almost ready, I added the chiles, because we like them on the crunchy side. 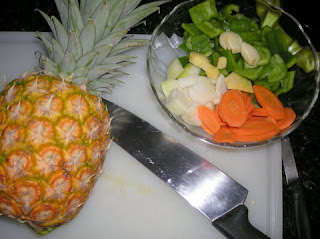 At the very end, I threw in the pineapple pieces just long enough to heat. El Jefe came along as I was cooking, saying, "Oh, boy! That looks good! I can smell it all the way upstairs. But it doesn't look like enough pineapple." 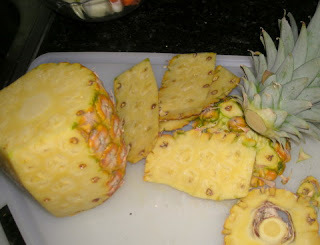 We stuffed delicious Honduran pineapple pieces into our mouths as we discussed how much pineapple to use and then ended up just dumping the whole bowlful in. It was a smallish pineapple. For the sauce, I used 1/2 cup of homemade chicken broth (from my stash in the freezer), 1/4 cup of water, a big spoonful of cornstarch, a couple of big glugs of soy sauce, the pineapple juice that had accumulated, and a couple of heaping tablespoons of hoisin sauce. I poured the sauce over the meat and veggie concoction and cooked it until thickened. Served over Basmati rice, it made about 4 servings. 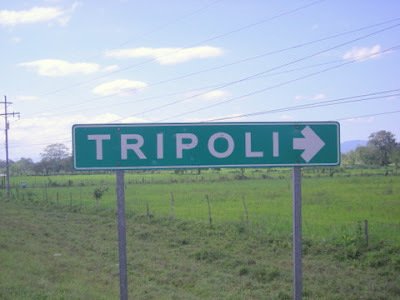 As I was writing these articles on Tripoli, Honduras, I wondered if Tripoli had ever made the Honduran newspapers. Unfortunately, it had. It gave me a whole new view on Tripoli. If you want to remain nostalgic about this little pueblo, you might just want to skip this article. I guess the newspaper articles demonstrate how narcotrafficking, fueled by the high US consumption of illegal drugs, affects everyone in Honduras in one way or another — even in tiny, generally crime-free, agricultural communities like Tripoli. I wish I had known about this before we visited Tripoli, because I definitely would have asked them about it. I don't think that I could have written about their responses, though, because it might have put them in danger. Not that I think any narcos read the Blogicito, but who knows. I never like to take any chances with information that people give to me. The plane and its two occupants burned, the news said. The occupants were unidentifiable. 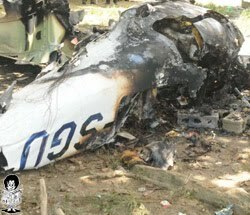 Police reported that burned remains of black plastic bags and white powder were found in the plane. 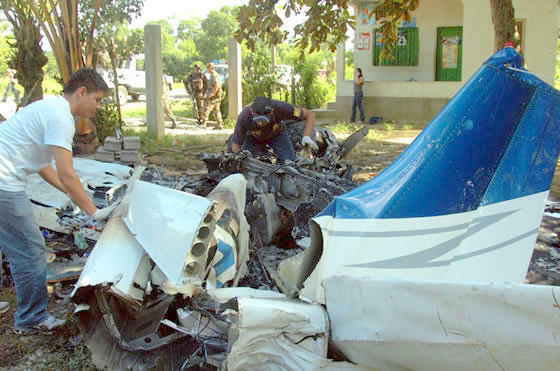 If you read the La Tribuna article (in Spanish), note that it goes on to write about a June 12 incident "in the same community" where fardos containing 500 kilos of cocaine were thrown out of a circling plane to the transportistas waiting below. I remembered that incident being in La Masica, not Tripoli, and it was. Another error was that 1,500 kilos of cocaine, not 500, were recovered in that operation. According to authorities, more than 100 tons of cocaine passes through Honduras in its route from Colombia to the United States each year. 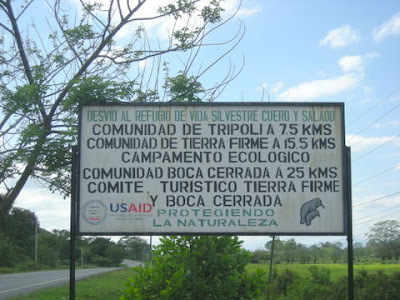 The 2009 El Heraldo article stated that each kilo of cocaine (~2.2 pounds) has a value of about US $6,000 in Honduras, but can be as much as US $26,000-30,000 in the US. I've been told that in past years, some Hondurans were primarily transporters and money launderers, but increasingly are becoming users, too. Sorry to end the Tripoli series on a sour note, but I guess that is part of the reality of Honduras. Hopefully, this doesn't affect the lives of the people of Tripoli and that their young people won't be tempted to be involved in drug trafficking. Don Pedro said he knew just the person we needed to talk to to find out more about the history of Tripoli. 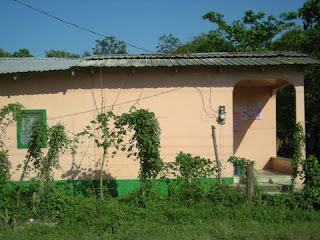 He showed us to Don Jesús' house to ask him if he would talk with us. He came out of his modest house (photo) perhaps a little suspicious, but very curious as Tripoli doesn't get a lot of visitors, especially foreigners. A young woman (also in the photo) who might have been his granddaughter brought out some wooden stools and one chair, which was offered to me. I tried to give Don Jesús the chair, but he insisted that I take it. At last we had someone who was born and raised in the area! We had an audience throughout our time with him. Several small children who were probably great-grandchildren wandered in and out. His granddaughter watched at the doorway and I could see another man inside who did not come out. 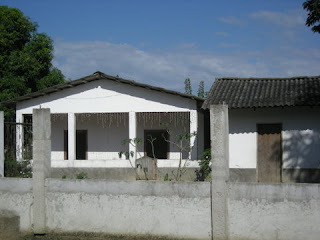 One of Jesús' grown grandsons and family lived next door and he stood by the fence between the properties watching and listening. That might have been out of curiosity or maybe to watch over his grandfather in case these strangers had bad intentions. El Jefe waived him over and invited him join the conversation, in which he seemed very interested. The following map shows all the places named in this article. 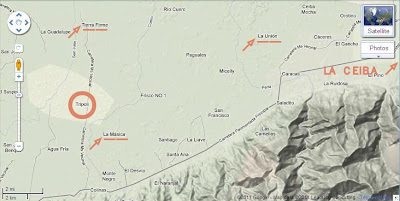 Although the various pueblos look pretty close to each, getting from one to another (except Tierra Firme) requires going back to the highway and taking a different bumpy gravel road north. This makes for a long bus ride as the buses stop at every pueblo along the way. 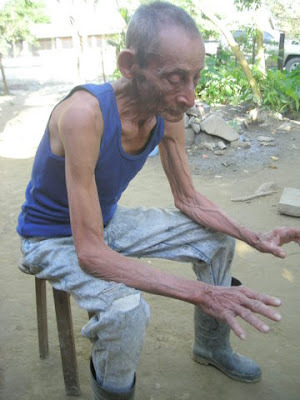 Don Jesús has a severe hearing problem which he told us came from an incident in which he used dynamite to kill fish in the river (for easier catching) — a dangerous practice which unfortunately is still sometimes done in Honduras, along with poisoning the fish. My original plan was to do a video interview, but between El Jefe shouting and repeating questions and Don Jesús saying, "Eh? What did you say? ", I abandoned that idea and just took notes instead. José de Jesús Medina was born in 1925, just up the road (which was only a path back then) in Tierra Firme. He even went inside to get his ID card to show us to make the interview official. He told us that the Tripoli area was partly underwater in the early days and only rice was grown. He said the whole area was fincas (farms) back then. 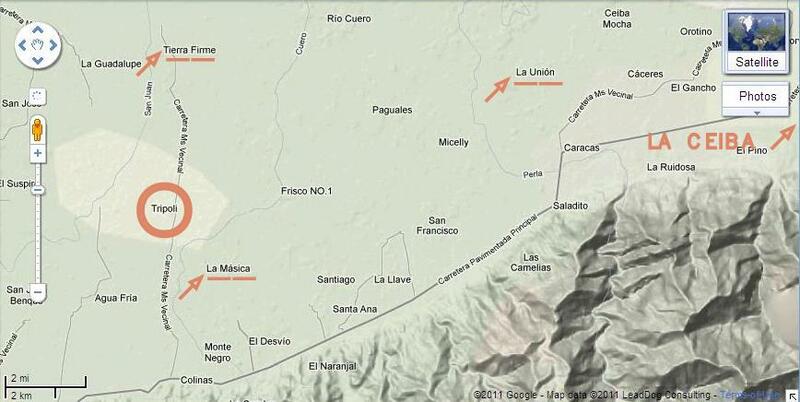 Gradually, "the company" filled in the area and eventually a small creek was filled and the road was built during the term of President Suazo Cordova (1982-1986). He remembered when Tripoli only had four houses. El Jefe asked if by 'company' he meant Standard Fruit (now Dole) and Jesús said yes, but I'm not entirely clear that he heard the question as he seemed a little confused. He also thought that "the company" had given Tripoli its name, but he didn't know why. 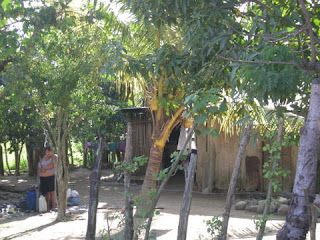 Jesús proudly told us that it was he who donated the land for the school which was across the street from his home. 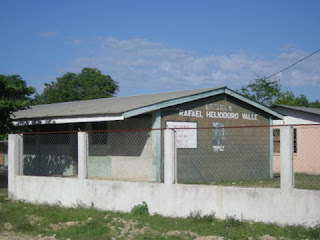 A sign on the school indicated that it had been built by FHIS (a government agency) during the Maduro administration (2001-2005). 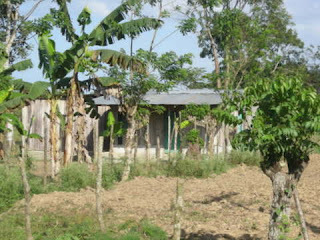 He said that the school even has a colegio (the upper high school grades), which many small town schools do not. He told us, however, that someone was trying to claim that he owned the land and was trying to take it away from the school. "That's not true!" he exclaimed. Hopefully, that doesn't happen. We asked about where he went to school, but he matter-of-factly told us that there were no schools for children of that area in those days. Don Jesús told us about entering the army when he was 17, and he remembered that he stayed exactly two years and nine months. El Jefe asked if he had joined the army or whether he had been snatched off the streets as was a common practice during much of Honduras' history. He laughed and said that no, he voluntarily joined. He said that President Tiburcio Carías (1933-49) treated the people like slaves and he was glad when he was ousted. He also told us that he was a Nacionalista, but we didn't get into politics any further than that. We said that Tripoli seemed to be a good place for children, with the school, health clinic, and the fútbol (soccer) fields, and asked about what kind of work was available for the young people of the area. Don Jesús told us that there was work for everyone, but only agricultural work. El Jefe asked what kind of work Jesús had done. 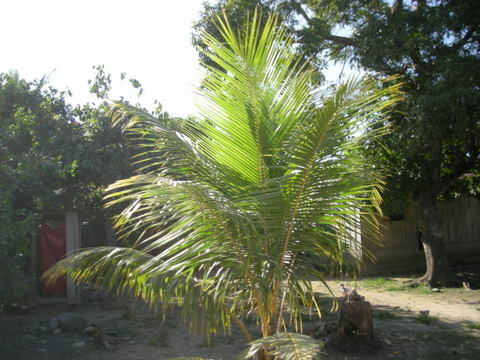 He answered in the present tense, saying "cleaning the potreros (fields) and palmeras (African palm plantations)", which means macheteing the fields to keep the weeds and tropical growth down and/or to prepare for new crops. El Jefe was shocked and asked, "Still?!" Don Jesús hollered back, "Sí, Senor! Todos los días!" (Yes, sir! Every day!) 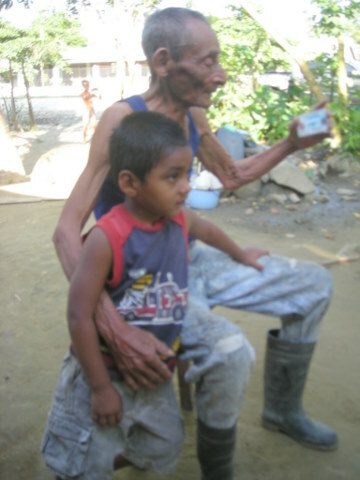 Amazingly, this frail-appearing, 86-year-old man works six days per week cleaning fields with a machete! He said he works from about 5-7 a.m. to about 1 p.m. Sundays through Fridays, taking Saturday off to go to church. "I like to work! I enjoy it. I've worked since I was 12-years-old." When asked if he ever goes to La Ceiba, he said not much, but that he occasionally goes to La Unión where one of his sons lives. He liked that his son sometimes gives him money or clothes. His grandson made a joke that his last trip will be to La Masica because there is no cemetery in Tripoli and La Masica had the nearest one. (Cultural difference in humor!) 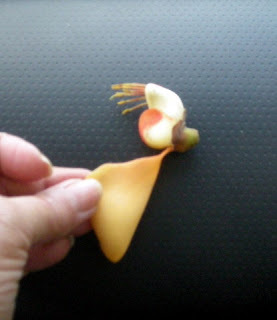 This photo shows a flower from the trees that lined the road to Tripoli. El Jefe said that when he was a little boy, they used to play with them, pretending they were roosters. 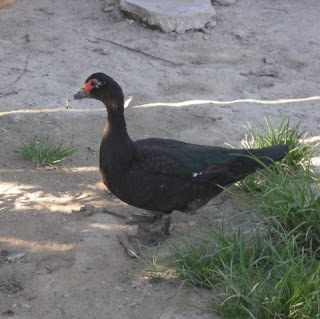 The duck and chicken photos in this article were all taken in or around Jesus' property. I was surprised to see the black duck. 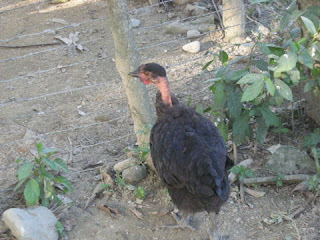 I see these bald-neck chickens (photo) all over the north coast and personally find them to be very unattractive. 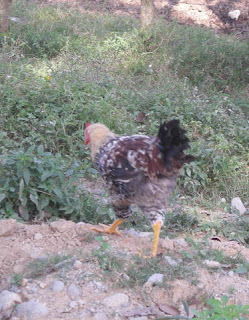 I've also seen many tail-less chickens and roosters. They must be selected for their egg laying or meat producing qualities because they sure are not as pretty as my chickens! On the other hand, I've been told that my bantams have no meat and they are lousy egg layers, too. Don Jesús mentioned that he plays three instruments, the mandolin, the accordion, and the violin. El Jefe asked if he could play something for us but he said that he only plays accompaniments with others. It could also be that he no longer has the instruments. We dropped Don Pedro off where he needed to go. The road back to the highway seemed to be 10 miles, not four, due to the bouncing around of the car in the ruts of the road. We may see the folks of Tripoli again sometime as there are some things that I want to check out further up the road. 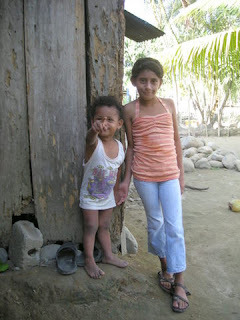 I hope that you enjoyed this little series with a view of the people and small town life on the north coast of Honduras. Credit goes to El Jefe, my collaborator, who helped me to remember some of the details and who showed (mostly) great patience with me yelling, "Wait! Wait!" to stop the car every few meters so I could take a photo. He really enjoyed it, too, so I'm sure we'll be doing this again.